The Kerry Hill Breed is from Powys, on the English/Welsh borders, and it derives its name from the village of Kerry, near Newtown. There are records of this distinctive breed in this area dating back to 1809, and the first Flock Book was published in 1899 with 26 Members. Registered Kerry Hill Sheep can be found throughout the British Isles, Ireland and Holland. A well balanced sturdy sheep with ears set high and free from wool. A black nose and sharply defined black and white markings on the head and legs. Both ewes and rams are hornless. It is a handsome sheep, with a dense fleece, which is usually white. The fleece handles well, and is amongst the softest of British Wools. Average staple length is 10 cm (14 inches). Average weight of fleece is 2.75kgs (6lbs). Bradford count 54-56's. In both ewes and rams, teeth should be regular and should meet the pad neither undershot or overshot. The weight of a mature ram will range from 65 to 70kgs. A mature ewe will weigh from 55kg to 65kg+. The Kerry Hill sheep are good on their feet and good in their teeth. 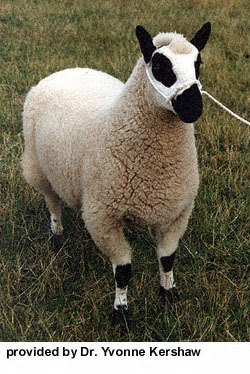 The sire to produce the ideal crossing ewe, noted for fertility. Crosses well with Hill and Long Wool breeds. Also widely used to cross with Hill type ewes, producing an almost perfect low weight joint from the male progeny. Both pure and crossbred carcasses are lean. A good quality white fleece. A hardy and attractive sheep, backed by a breed history of more than 150 years. The perfect mother - a lambing percentage of 175 is readily achieved. She adapts readily to all forms of sheep husbandry, with good foraging abilities and economic winter feeding requirements. 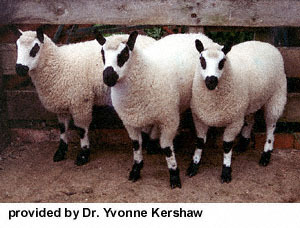 It is noted that the ewe makes an excellent cross with Down ram breeds. These lambs are outstanding and mature early, have good conformation and length and are lean quality meat. 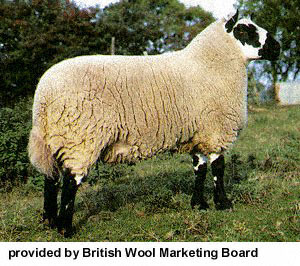 When crossed with Long Wool breeds e.g. Blue-faced Leicester, a very fine hybrid ewe is produced. This is where the Kerry Hill excels herself in producing a large strong framed sheep that can be crossed with quality meat types, to produce the ideal type of carcass, that is sought after today. An excellent lean lamb carcass which can reach 19-24 kgs. Thriftiness and longevity resulting in low depreciation costs - suckles well, and good liveability at birth is characteristic of the breed. Kerry lambs will market at 16kgs (35lbs) at 12-14 weeks old or if kept on as stores will produce a good lean carcass of some 20-25kgs (45-55lbs) the following spring. Ewes and rams are always available for sale privately, or at sales held at Knighton and Kerry (Powys) in September. Official ram sales are held at the N.S.A. All Breed Ram Sale at R.W.A.S. Llanelwedd, Builth Wells in September.